Yorgos Lanthimos (The Lobster, Killing of a Sacred Deer) brings his off-kilter humor to this dark period-piece comedy about a poor but clever scullery maid (Emma Stone) who ingratiates herself to England’s ailing Queen Anne (Olivia Colman) with intentions of replacing the Queen’s longtime confidante and political proxy (Rachel Weisz). You can think of it as a quirky retelling of All About Eve. The Favourite, I suspect, will be an acquired taste for most viewers. I fell under its spell for the first hour, marveling at the set and wardrobe design, all three of the leading performances, and frequently snorting at some of their sardonic line deliveries. If the film had maintained that level of irreverence, I think I would have enjoyed it more overall. Instead, Lanthimos goes dark, removing humor from the proceedings at an exponential rate. While I very much loved the tragic final moments of the film, they were not the ending I wanted to the comedy I was watching prior to. I love and applaud experimentation with tone most of the time, but it just didn’t work for me here. 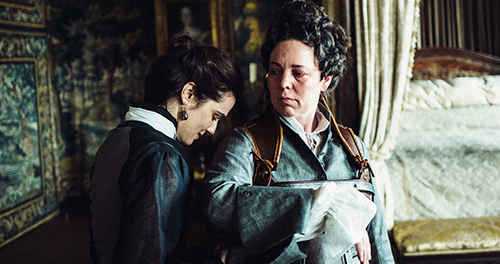 There’s still a lot I admired about The Favourite, though. Chief among them are all the encounters between Stone and Weisz, who for a long time foster a professional air of pleasantry in their exchanges, even when the undercurrent is absolutely scathing. Colman’s performance is also remarkable in the range it affords the actress to demonstrate. We see her childlike, in agony, in ecstasy, confused, powerful, weak — it’s a juicy schizophrenic character and could wind up winning Colman some Oscar gold for it. I was also pleased to see Nicholas Hoult (About a Boy, A Single Man) stretch himself in a droll, antagonistic role.